The Orthodox Jewish community of St. Louis dates back to the early 19th century. Though it began small, in the 1880’s and 1890’s waves of Orthodox Jews from Russia and Poland emigrated to the United States and to St. Louis. By the 1940’s there were close to 25 Orthodox synagogues in St. Louis. These congregations for the most part did not have official Rabbis at their helm and instead were established and led by laity interested in having a place to pray with a minyan. Eventually many of these developed into full service synagogues with communal events, cemeteries, and holiday and life cycle celebrations. This model of Orthodox community in St. Louis was akin to that in much of Eastern Europe; small synagogues in which to pray, run by knowledgeable and not-so-knowledgeable laity, all under the auspices and direction of the Chief Rabbi of the city. In the late 19th century the Chief Rabbi, well known for his scholarship and community leadership, was Rabbi Zacharya Yosef Rosenfeld. Rabbi Rosenfeld was the first Rabbi to, against much opposition, establish an eruv in a large modern city. Though by the 1960’s most of St. Louis’ still extant Orthodox synagogues had their own rabbis, St. Louis did maintain the position of Chief Orthodox Rabbi and indeed was the last American city to do so. Several illustrious Rabbis Held the position and Rabbi Sholom Rivkin, St. Louis’ last chief rabbi , passed away only a few years ago. Most of those early Orthodox synagogues are now gone, their members having passed on and their children and grandchildren, due to the relative lack of Jewish education in America in those days, having assimilated or moved to cities with larger observant Jewish populations. Only a handful of St. Louis’ Orthodox synagogues remain from that era, – the oldest among them Bais Abraham. 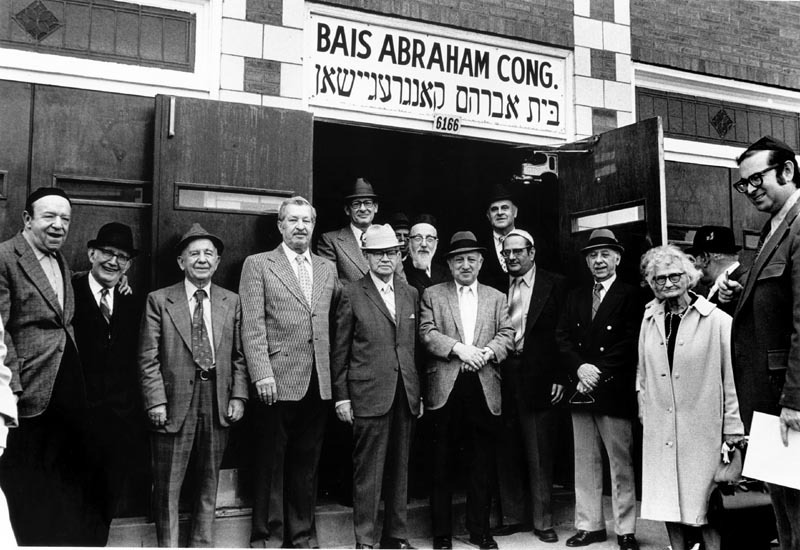 Bais Abraham Congregation was founded by 25 members in 1894 in downtown St. Louis. “Bais Abe,” as it is often known, settled in its present location in University City, near Washington University, in 1973, under the leadership of the much-beloved Rabbi Abraham Magence who served as a Rabbi in St. Louis, a mohel and shochet for close to 50 years. Born in Suvalk, Poland to the Av Bais Din of the city, Rabbi Abraham Magence learned in the Grodno Yeshiva with Rabbi Shimon Shkop. He left the Yeshiva to flee to Russia from the war, where he was imprisoned and tortured by the KGB for teaching Torah to children. Ultimately Rabbi Abraham Magence was brought to St. Louis by his brother Rabbi Tzvi Magence, author of the Magen Tzvi, a learned work on the holiness of the Land of Israel, a student of Rabbi Abraham Isaac HaKohen Kook and Rabbi of a shul in St. Louis, Beis HaMedrash HaGodol. Rabbi Abraham Magence, Rabbi of Bais Abraham for over 30 years, was famous for his outreach to new Russian Jewish immigrants and to Washington University students, for his love of children, for his inclusion of women, and for open-minded relations with all—Jewish and non-Jewish alike—while maintaining the Orthodox character of Bais Abraham. Ten years ago I was honored to take over from Rabbi Magence and to continue building on this unique community’s glorious heritage. Today, with G-d’s help and the community’s help, Bais Abraham is an active, dynamic shul with increasing numbers of young couples and families, a strong relationship with nearby WashingtonUniversity students, and a model for other Jewish communities. Bais Abe is well known for developing new programming and fostering new relations with Jews previously distanced from synagogue life. Bais Abraham Congregation, presently St. Louis’ oldest Orthodox synagogue, is celebrating its 120th anniversary this year. The thriving congregation, now located in the Delmar Loop at 6910 Delmar Boulevard, will hold a Gala celebration on March 30th, to pay tribute to its long and notable history. The gala celebration will recognize me and my wife, Sara Winkelman, for our ten years of service to Bais Abraham. Lay leaders Keren and Gabe Douek will receive a Young Leadership Award. A native St. Louisan, Gabe and his wife Keren represent the vibrancy of Bais Abraham’s next generation and its second 120 years of growth. The evening will feature dinner and musical entertainment by acclaimed new Jewish-klezmer-jazz-garage-punk band, Juez. All are invited to celebrate this historic milestone together with the Bais Abraham community. Please see http://www.baisabe.com for more details. Leaders of Bais Abraham in 1973, standing with then chief Rabbi of St. Louis, Rabbi Menachem Eichenstein, author of Shaylot U’Tishuvot Pri Yehoshuah. This entry was posted on Friday, March 7th, 2014 at 4:10 AM and is filed under Jewish Thought. You can follow any responses to this entry through the RSS 2.0 feed. You can leave a response, or trackback from your own site.